When you finally get outside and go camping, you want the best camp stove or best camping grill for your needs. This doesn’t mean the most expensive camp stove and grill combo — just the camp stove or camp grill that will get the job done and enhance your experience. Part of the great joy of camping is camp cooking — frying up pancakes in the morning and grilling in the evening. Everything tastes better outside when you’re camping. Case in point? Baked beans. They’re way better when you’re camping. To help you do more than roast hot dogs over a fire, we’ve put together this handy guide to the best camping stoves and camp grills for 2018 and beyond. And what do we mean by best? 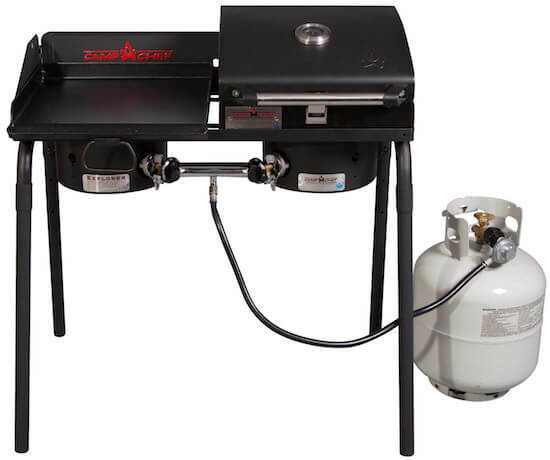 We recommend camping stoves and grills that are portable, easy to clean and easy to operate. This doesn’t necessarily mean the best has the most features — your personal best likely is a blend of portability, function and overall value. In fact, your own personal best might be the least expensive option because you’re also busy choosing your own best camping tent. Camp cooking results: Everything tastes better when you’re camping. You have a choice: Get a typical camp stove, get a portable grill for camping, or get a hybrid camp stove and grill system. A camping stove typically offers propane-based burners for frying pans, pots and big flat griddles. 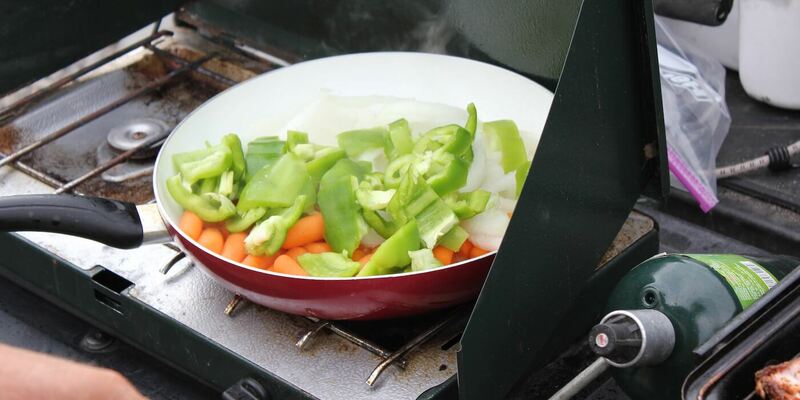 With a camp stove, you’re going to fry, sauté and boil. 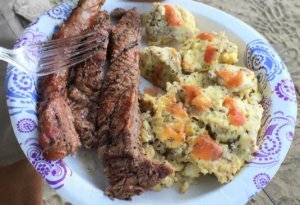 Think scrambled eggs, bacon, pancakes, hash browns or fried potatoes, and if you’re a veggie lover, you can even pack a stir-fry pan. Camping stoves are versatile and easy to clean — because most of the cleaning is with the pan, pot or griddle you cooked with. A camping grill is a portable grill, sometimes called a portable barbecue. You put your meat or veggies directly on a wire rack or heavy grill surface and cook away. Think hamburgers, hot dogs, steaks, shish kabobs and roasted veggies. While you can place a cast iron frying pan on a grill and get a pancake off of it, camping grills are best suited for grilling. 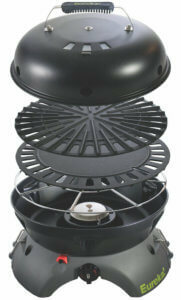 Hybrid camp stove and grill combos combine both types of cook surfaces in one handy unit. When you’re tight on space — for instance, car camping with a big family in a packed car — a camp stove/grill combination is sometimes the most space-affordable way to go. A camping stove/grill combo like the Eureka! Gonzo Grill Cook System lets you cook in a variety of ways. What are the top 5 best camping stoves? What are the top 5 best camping grills? What are the top 5 best camping stove/grill combos? The Coleman Classic Propane Stove easily offers the best overall price-to-value ratio. It’s simple yet effective, inexpensive yet surprisingly durable. In fact, because it’s so simple in design — there are few parts — there is very little to go wrong with it. Can you drop it and dent it? Definitely. Will it keep working? Very likely. You can frequently find it on sale for less than $45, which is a steal. As it turns out, the Coleman Classic Propane Stove is surprisingly usable, too. It boasts a whopping 20,000 BTUs of heat output and the two-burner cooking area can fit a 12-inch and 10-inch pan simultaneously. Better yet, the wind-blocking panels adjust outward to help you fit larger pans on the burners. Fussy camp chefs might pine for better flame adjustability, but seriously, the adjustability is pretty darn good. A typical 16.4-ounce propane canister will get you about one hour of cooking with both burners maxed out on high — but rarely do you need that much sustained heat. If you want a slightly updated experience, try the Coleman Triton Stove, but if you’re on a tight budget, nab the Coleman Classic Propane Stove and don’t look back. If you’re looking for a powerhouse camp stove that’s a step up in overall quality but doesn’t stray from easy-to-use simplicity, it’s hard to go wrong with the Camp Chef Everest 2-Burner Camping Stove. It features two high-pressure 20,000 BTU burners (40,000 BTU total) with a strong nickel-coated steel cooking grate. It has a matchless ignition system and a stainless steel drip tray for easier cleanup. So, when is this kind of BTU output handy? In cold weather, windy weather and anytime you want to brew coffee ASAP. The key feature of the Stansport Outfitter Series 3-Burner Stove is its extra third burner. This durable camp stove also boasts two oversized burners that put out a whopping 25,000 BTUs each while the smaller center burner puts out 10,000 BTUs. The piezo electronic ignition makes lighting the stove easy (but always pack matches as a backup). The heavy-duty cooking grates are a nice bonus. If you like to cook from a single large rectangular griddle, that extra middle burner can help you tine tune the heat across the griddle surface. While we’re on the topic of Stansport, the Stansport 2-Burner Propane Stove is also a great deal — just a little less robust — but it’s also very affordable. If you tend to go camping for a week at a time — or go with a full crew of family and friends — go big with the awesome Camp Chef Explorer 2x Two-Burner Stove. The value is just fantastic: You get two massive 30,000 BTU burners and four removable legs so you don’t need to take over any table-top space with this stove. Instead of a little canister, you attach this stove to a propane tank. Accessories make this stove standout: You can add a large griddle as well as a BBQ box, which turns one burner into a grill. There is more, though: Add the Artisan Pizza Oven accessory and bake pizza in the backcountry. So cool. If you’ve rather have a more foldable design for easier packability — along with fold-out side shelves — check out the Pro 60X Two-Burner Stove (which also accepts the aforementioned add-on accessories) or the 3-burner Pro 90X. There are several camp stoves with similar designs that are nearly as good as our picks and offer decent price-to-value ratios. We would happily cook on the Eureka Spire LX Camp Stove or Primus Profile or most any other stove from Camp Chef. Want ultimate durability? Go with a Partner Steel 2 Burner Stove or foldable Partner Steel 4-Burner Stove. Most stylish? The Primus Tupike Propane Camp Stove. If you want two burners in a more packable profile, try the Jetboil Genesis 2-Burner Stove or go with the single-burner Coleman Powerpack. If you want a simple ultralight option — which can do double duty as a backpacking stove — go with the MSR PocketRocket 2 Stove. For lunch and dinner at the campsite, it’s hard to beat a portable camping grill. Of course, if you’re camping, you can sometimes just throw a steel grate over a campfire or use sticks to roast hot dogs. Not a bad plan — and sometimes very enjoyable. Still, some camp sites don’t allow fires and some camping areas get too dry and have outright bans on campfires. When this happens, your portable camping grill can save the trip. The Weber Go-Anywhere Gas Grill is a small, lightweight super-simple grill with an excellent price-to-value ratio. There are a few other models like it on the market for a bit less cost, but the overall quality drops too low. The construction of the Weber Go-Anywhere Gas Grill, on the other hand, is sturdier overall and the quality of the burner and porcelain-enameled cooking grate are a step up to give you more even cooking. The push-button ignition is also handy. Of course, this is not a fancy grill, but it gets the job done — we’ve cooked up mouth-watering steaks, hamburgers, hot dogs and grilled veggies. Pay a little closer attention to what you’re grilling, and it won’t let you down. For more detail, read our full Weber Go-Anywhere review, which includes our recommendation for a perfectly sized storage/travel box. There is a lot to like about the Coleman Roadtrip LXE Propane Portable Grill. It features a collapsible stand with wheels, making it easy to use without a tabletop while retaining decent mobility. The 285 inches of porcelain-coated cast-iron grilling surface gives you plenty of room, and two independently controlled adjustable burners let you grill different kinds of food easier than when you’re limited to a single burner system. This Roadtrip LXE also lets you buy accessory interchangeable “Swaptop” cooktops to add a griddle or even a stove top grate, making this a versatile choice to build from. You also get a removable grease pan and two slide-out tables. In addition, the LXE delivers a very respectable 20,000 BTUs of grilling power. The Weber Q1200 Propane Grill — and any of the smaller grills in the Q Series lineup, actually, work very well as camping grills. The Q Series is made from a heavy-duty cast aluminum lid and body. It uses porcelain-enameled cast-iron cooking grates, which work well when you let them heat up before you start grilling — this grill puts out about 8,500 BTUs, so your lighting-to-grilling speed requires a 5-minute or so warmup for best results. The lid has a built-in thermometer and you get a removable grease catch pan. The burner control is effective, too, and the stainless steel burner is stout and should last multiple seasons. The folding side tables are very handy, but we recommend taking a few plastic grocery bags with you to place over them when you pack up to leave the campsite — if you don’t clean the grill before you head home, the bags will help keep your side tables clean during transit. Of course, you can skip the side tables entirely and get the same basic 189 square inches of grilling surface from the Q1000. It also lacks a thermometer, but it’s very similar overall and cooks just as well. One last point: The Q1200 comes in a variety of bright and cheery colors. Cuisinart makes a few different small and relatively portable gas grills, but we think the best is the smallest and least powerful — the Cuisinart Petit Gourmet Portable Tabletop Gas Grill. This little grill folds up for easy travel and weighs just 13.5 pounds. The 145-square-inch grill surface is a bit small, but that also means that the 5,500 BTUs the stainless-steel burner puts out can heat the whole unit pretty well. The grate is porcelain-enameled. While we don’t recommend this grill for a lot of heavy-duty use, it’s a thoroughly decent little grill for most camping use and day trips to the river or beach. The allure of the red and black Smoke Hollow Vector Series Smoking Tabletop 3-Burner Gas Grill is undeniable: A third-burner system lets you add wood chips to turn this portable, table-top grill into a smoker. Of course, it’s not really aimed at competing with true barbecue smoking systems, but if you want to smoke a salmon filet at camp, this is the portable grill for you. All-in-all, the Smoke Hollow Vector is one of the most fully-featured portable grills available today: You get a large, robust design that includes a warming rack that creates an astounding 367 inches of total cooking area. The main wire cooking grid is porcelain-coated. You get two large twice-folding table tops, push button ignition, a built-in temperature gauge, easy-clean drip tray, and, of course, 3-burners, the middle of which lets you add wood chips for smoky BBQ awesomeness. Another nice feature is the use of three legs rather than four, which actually makes it easier to stabilize the grill on top of warped picnic tables or uneven ground. For portability, the lid locks shut, the tables fold down, and the legs fold in, but there is no denying the fact that the Vector is a bit chunky when it comes to portability. In addition, it’s designed to be hooked up to propane tanks (rather than small 16.4 oz propane bottles). If you want to increase the portability of the Vector Series, you might opt to pick up a smaller 1-gallon propane tank rather than a standard 4.5 gallon tank . . . or nab the VT280SS1 Vector Series, which is essentially the same but doesn’t include the folding table tops (and costs a bit less). What About Portable Charcoal Grills? Pretty much everyone loves the tasty results that come from grilling over charcoal, but most campers don’t like to take the time to plan ahead. You have to light the charcoal and then wait for it to thoroughly turn into hot coals ready for cooking. If you want to go with charcoal, it’s hard to beat the Lodge Cast Iron Sportsman’s Charcoal Grill. It’s heavy so it holds heat well. It’s rugged. The grill has two adjustable heights. A door lets you add a few coals if you need to keep the grilling going longer than expected, i.e. everyone wants another helping of whatever you grilled up. And you can add some wood chips for a little extra smoky flavoring. To help add heat to thicker cuts of meat, some fans will place a cast iron pan over the top of their steaks or use a lightweight roasting pan lid that fits the basic size of the grill. It’s not necessary, of course, but it’s another technique that you can use to extend and adjust cooking with charcoal. The Coleman NXT Lite Table Top Propane Grill is another solid little grill, which is best when you want to add a griddle or stove top accessory grate. The Char-Broil Grill2Go is better than its price point, making it another great value grill. The Blackstone Dash Portable Grill/Griddle offers a different take on the grate, which drains grease to a reservoir at the front. With just 105 square inches of cooking space, the Coleman Fold N Go+ Propane Grill is one of the best small grills we’ve seen. Finally, if you want a top-of-the-line portable camping grill, try the Solaire Anywhere Portable Infrared Propane Gas Grill with Marine Grade Stainless Steel. Wow. 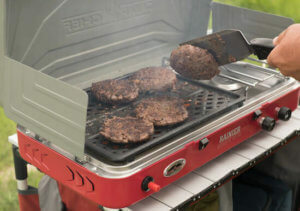 The Camp Chef Rainier Campers Combo blends a standard camp stove burner with a larger camp grill or camp griddle. Better yet, you don’t have to buy separate accessories to make this system work: All in one package, you get the stove, of course, along with a non-stick coated aluminum grill, a non-stick coated aluminum griddle, and a carry bag that holds it as well as two 16.4 oz propane canisters. In addition, it comes with an ignitor, a stainless steel drip tray to catch any grease, and the windscreens are big and sturdy. What you end up with is a highly packable, flexible cooking system that will let you make pancakes and bacon on one side while you brew coffee on the other. For lunch or dinner, you can choose to fry hamburgers — or grill them — or grill up some hot dogs and heat some pork and beans at the same time. We have to give props to Eureka! for thinking outside of the standard stove/grill rectangular box: The Eureka! Gonzo Grill Cook System is round — and it has a great name. It comes with a stove grate and a cast-iron griddle that reverses to give you a raised grilling surface. Because the grill completely covers the round burner beneath, it’s a bit easier to avoid flare ups that sometimes occur when you’re grilling fatty hamburgers over more exposed flames. Of course, you get a removable drip tray. 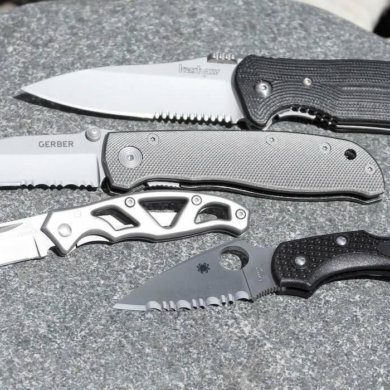 In addition, if you’re planning on a major outing, you can use the Eureka! JetLink Output Port to connect multiple Eureka! Grills or stoves if you want to run off of, say, a single large propane tank (requires optional hoses). The Camp Chef Tailgater Combo is fantastic for larger groups and longer camping stays. You get two big 30,000 BTU stove burners on a freestanding frame with windscreen (and removable legs). But there’s more: You also get the Camp Chef Professional Flat Top Griddle, which is big enough to crank out breakfast for multiple campers, as well as the included Deluxe BBQ Grill Box, which gives you 224 square inches of grilling space. The whole system is robust and runs off of a propane tank, which is basically the only downside: it’s not the most portable system, but if you want to make a statement cooking for friends and family, consider the Camp Chef Tailgater Combo. The Blackstone Grills Tailgater is another great freestanding camping grill/stove combo. Its main claim to fame is that its legs are independently adjustable, which is handy for leveling the grill/stove combo on uneven ground, which is particularly important when you want to ensure the perfect coverage of grease or oil on your griddle. One cast-iron round burner produces 20,000 BTUs while the second grill/griddle burner is stainless steel and shaped to cover more area. This second burner puts out 15,000 BTUs. The Tailgater package includes a grill box as well as a griddle, both of which remove to expose the burners, which you can put pots over, of course. One last compelling feature is the addition of two extra-large grease trays, one for each side. Remember the Coleman Roadtrip LXE? You can buy an accessory griddle or stove grate, turning it into a great combo. If you want a fairly large cooking area with a freestanding design that also folds up for easier travel, the Roadtrip LXE should make your shortlist.